The cultural appropriation of archaeology is a form of structural violence. The term ‘cultural appropriation’ is generally applied when the subject culture is a minority culture or somehow subordinate in social, political, economic, or military status to the appropriating culture; where a more powerful culture raids a less powerful neighbouring one; or when there are other issues involved such as a history of ethnic or racial conflict between the two groups. It can include the appropriation of various forms of cultural heritage, such as dress, food, music, art, icons, rituals, language, religion, holy places, historical and archaeological sites. These elements, once removed from their indigenous cultural contexts, may take on meanings that are significantly divergent from, or merely less nuanced than, those they originally held. In the process of the Zionist colonisation of Palestine and the gradual dispossession of Palestinian land, Israeli archaeology has been actively employed in divesting Palestinians of their history and appropriating their cultural heritage. In this context Biblical archaeology has played a significant role. Its goal has been to establish a link between the modern State of Israel and the ‘Israelite’ period, and as a result the pluralistic nature of Palestine’s past has virtually vanished from public awareness, and with it the Arab past, traditions and cultural heritage. Many archaeological, historical and holy sites in Palestine / Israel that are an integral part of Palestinian cultural heritage have been appropriated as ‘biblical’ or ‘Jewish’. In the meantime, Israel continues to intensify its Judization of archaeological sites in the West Bank and Jerusalem. This paper presents a case study of the cultural appropriation of archaeology in Palestine. إن إنتحال التراث الثقافي للآثار هو شكل من أشكال العنف البنيوي. ويستخدم اصطلاح “إنتحال التراث الثقافي” عموماً عندما تكون الثقافة الخاضعة ثقافة الأقلية، أو أنها تابعة إلى حد ما للثقافة المُنتحِلة من حيث وضعها الإجتماعي، السياسي، الإقتصادي أو العسكري؛ حيثما تقوم ثقافة أقوى بغزو ثقافة أضعف بجوارها؛ أو حينما تتفاعل قضايا أخرى، كالصراع الإثني أو العرقي بين مجموعتين. ولعلها تتضمّن إنتحالاً لشتى أشكال التراث الثقافي كاللباس والطعام والموسيقى والفنون والمعبودات والطقوس واللغة والدين والأماكن المقدسة والمواقع التاريخية والأثرية. وحينما تُنتزع هذه العناصر من سياقاتها الثقافية الأصلية فإنها تتخذ معانٍ متباعدة كلياً، أو أنها تحمل فوارق دقيقة عما كانت عليه في الأصل. In the process of the Zionist colonisation of Palestine and the gradual dispossession of Palestinian land, Israeli archaeology has been actively employed in divesting Palestinians of their history and appropriating their cultural heritage. In this context Biblical archaeology has played a significant role. Its goal has been to establish a link between the modern State of Israel and the ‘Israelite’ period, and as a result the pluralistic nature of Palestine’s past has virtually vanished from public awareness, and with it the Arab past, traditions and cultural heritage. Many archaeological, historical and holy sites in Palestine/Israel that are an integral part of Palestinian cultural heritage have been appropriated as ‘biblical’ or ‘Jewish’. In the meantime, Israel continues to intensify its Judization of archaeological sites in the West Bank and Jerusalem. This paper presents a case study of the cultural appropriation of archaeology in Palestine. إن إنتحال التراث الثقافي للآثار هو شكل من أشكال العنف البنيوي. ويستخدم اصطلاح "إنتحال التراث الثقافي" عموماً عندما تكون الثقافة الخاضعة ثقافة الأقلية، أو أنها تابعة إلى حد ما للثقافة المُنتحِلة من حيث وضعها الإجتماعي، السياسي، الإقتصادي أو العسكري؛ حيثما تقوم ثقافة أقوى بغزو ثقافة أضعف بجوارها؛ أو حينما تتفاعل قضايا أخرى، كالصراع الإثني أو العرقي بين مجموعتين. ولعلها تتضمّن إنتحالاً لشتى أشكال التراث الثقافي كاللباس والطعام والموسيقى والفنون والمعبودات والطقوس واللغة والدين والأماكن المقدسة والمواقع التاريخية والأثرية. وحينما تُنتزع هذه العناصر من سياقاتها الثقافية الأصلية فإنها تتخذ معانٍ متباعدة كلياً، أو أنها تحمل فوارق دقيقة عما كانت عليه في الأصل. في خضمّ عملية الإستيطان الصهيوني لفلسطين وما تضمّنته من أعمال السلب والإقتلاع التدريجي للشعب الفلسطيني من أرضه، جرى إستخدام علم الآثار الإسرائيلي بصورة فعّالة لإقصاء الفلسطينيين عن تاريخهم وانتخال تراثهم الثقافي. في هذا السياق، لعب علم الآثار التوراتي دوراً هاماً، وكان هدفه إيجاد علاقة بين دولة إسرائيل الحديثة والعصر "الإسرائيلي" القديم. ونتج عن ذلك أن الطبيعة التعددية لتاريخ فلسطين قد اختفت فعلياً من الوعي العام، واختفى معها أيضاً التاريخ والتراث الثقافي العربي القديم. كما وجرى إنتحال العديد من المواقع الأثرية والتاريخية والأماكن المقدّسة في فلسطين، التي تشكّل جزءاً لا يتجزء من التراث الثقافي الفلسطيني، بصفتها "توراتية" أو "يهودية". في هذه الأثناء، تواصل إسرائيل مساعيها لتهويد المواقع الأثرية في الضفة الغربية والقدس. وتعرض هذه الورقة دراسة خاصة عن إنتحال التراث الثقافي للآثار في فلسطين، وتتمحور حول قلعة القدس. The Citadel of Jerusalem is one of the most significant landmarks in the topography of the city. Its structure spans more than 2000 years. It is situated at the western entrance to the Old City immediately to the south of Bab al-Khalil (Jaffa Gate). Extensive archaeological excavations at the citadel were carried out by C.N. Johns on behalf of the British Mandate Department of Antiquities of Palestine during the 1930s and 1940s. These excavations revealed a castle that is a remarkable example of Islamic and medieval military architecture (Johns, 1950). Its plan is an irregular rectangle consisting of curtain walls, connecting six massive towers around an inner courtyard; all are surrounded by a moat. It was essentially rebuilt by the Mamluk sultan al-Nasir Muhammad in 1310 over remains of fortifications from the Hellenistic, Herodian, Roman, Early Islamic, Crusader, and Ayyubid periods, as well as substantial additions from the Ottoman period. This formidable fortress was a centre of power and government that played a significant role in the political and social life of the city of Jerusalem until the early 20th century. Following Israel’s occupation of East Jerusalem along with the rest of the Occupied Palestinian Territories, Israeli excavations at the Citadel have been concerned principally with its ancient biblical history. A large excavation and restoration project in the 1980s’ was designed to transform the whole Citadel into a museum dedicated to the history of Jerusalem. In recent years I have carried out a comprehensive archaeological and architectural analysis of the citadel, which will be published soon by Oxford University Press as a CBRL monograph. 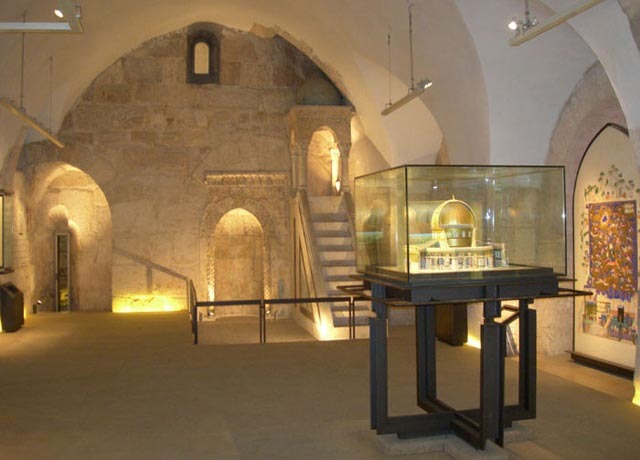 Founded in 1988, the museum named the ‘Tower of David Museum of the History of Jerusalem’ presents the history of Jerusalem by displays and modern visual techniques. The permanent exhibit has no archaeological artefacts and it consists almost entirely of reproductions of archaeological relics housed in other places, and reconstructions or simulations of architectural forms. It also makes use of maps, drawings, holograms and early films. The displays are housed in the halls of the towers surrounding and overlooking a courtyard full of excavated archaeological structures. Temporary exhibits and displays are organised either indoors or in the courtyard among the archaeological remains. Each hall represents an era or a series of related periods in the timeline history of Jerusalem, spanning over four millennia, from its beginning as a Bronze Age / Canaanite city until modern times. These are organised as follows: the First Temple period through the Babylonian Exile, the Second Temple period through the destruction of Jerusalem in 70AD, the Byzantine, early Islam, Crusader and Ayyubid Jerusalem, the Mamluk and Ottoman periods, and finally the late nineteenth century through the establishment of the State of Israel, and the war of 1948. This last hall deals with European influence and the history of modernization alongside that of Jewish immigration to Palestine. Reconstructions of architectural forms include a hologram of the First Temple and models of the Second Temple and the Dome of the Rock, a simulation of the Church of the Holy Sepulchre, films of the railroad in early twentieth century Palestine, and finally, a six screen video montage of the events that led to the rise and fall of the British Mandate in Palestine and culminated in the establishment of the State of Israel. At this final moment of the display, the Israeli national anthem is played and the Israeli flag rises to replace the British one. The only “real” objects are in the early Islamic hall: the Ottoman mihrab and minbar of the mosque that once occupied the hall, and two Arabic inscriptions from Ayyubid and Mamluk times. Since it has been designed as a “museum without objects”, the Citadel serves only as a “historical setting” (according to the original curator of the museum, as quoted by Abu El-Haj, 2001: 171). The architectural structure of the Citadel and the excavated archaeological remains in the courtyard provide the museum with a general aura of historical continuity and longevity. The juxtaposition of the historical and the modern in it’s design, and the fact that the Citadel’s own history is not presented and interpreted in detail, are both essential to the credibility of the history that is exhibited. That history locates Jerusalem’s origin, identity, and destiny in its role as the spiritual and political capital of the Jewish people. This is a story with Israelite origins and an Israeli ending. The first exhibition hall displays the First Temple period, which tells the story of David’s conquest of the city and his transformation of Jerusalem into the spiritual and national capital of the Jewish people. It is the display of Jewish history in Jerusalem that is the thread of continuity that weaves together each subsequent exhibition hall and each succeeding era: the Babylonian exile or Second Temple period, Byzantine or early Islamic periods. Archaeology has played a determinative role in providing Israeli society with historical illustrations and myths to identify with, contributing to the emergence of Israeli national identity. It has also played an important role in understanding Jerusalem’s history, but in the case of the Citadel of Jerusalem it is silent. In the museum, very little is said about either the building or the site. Most architectural features are not labelled, including the two Arabic inscriptions, the mihrab and minbar in the former mosque that houses the early Islamic, Crusader and Ayyubid period. These features are an integral part of the original function of the building itself and of the setting of the museum, but are not part of the display. The story told by the exhibit relies on this architecture as its shell, but makes no serious attempt to present an overall interpretation of the structural history of the Citadel. The fact that the site’s own history is not narrated in detail, or at best discussed only briefly as a prelude to the actual tour, is essential to the credibility of the history exhibited. The majority of the population of the Old City of Jerusalem, namely the Palestinian community, were not consulted or brought into the planning and implementation of the conservation of the Citadel and the housing of the museum within it, either as partners or as “stakeholders”. No local Palestinian professional or academic specialists, community leaders or organisations were included. This reflects the way that the Palestinian inhabitants of Jerusalem are alienated and powerless, and of how their cultural heritage is being appropriated. The values of conservation that are set in the basic guidelines and charters introduced by various international organisations such as ICOMOS and UNESCO have not been not observed, particularly regarding the recording of the monument and the interpretation and presentation of its structural history. In addition, the museum organises various activities geared mainly towards the Israeli Jewish audience and to school children in particular. The whole structure is frequently used as venue for Israeli national events and rallies, such as Israel’s Independence Day, and Reunification of Jerusalem Day. Within this context one can understand the motives behind the re-naming of the Citadel as “the Tower of David”, which has had remarkable consequences for the understanding of its historical and cultural character. For nearly a millennium the Citadel has been known by its Arabic name, al-Qal’a (the Citadel), whether in contemporary literary sources or by the local Palestinian population of Jerusalem. Changing its name gives visitors an incorrect impression of its real history and cultural character, and creates unjustified misconceptions. This has been done in keeping with a standard Israeli practice of re-naming Arab place-names so that they are seen to have a biblical or historical, Jewish precedent. The name Tower of David is mentioned for the first time by the Italian pilgrim Piacenza (ca. 570), who reported that Christian pilgrims prayed at the site (Piacenza, 1896: 13ff). It seems that a popular legend in sixth century Byzantine Jerusalem associated the first century BC Herodian tower, which had survived to a considerable height, with King David. During the early Islamic period the site was converted into an Islamic shrine named Mihrab Dawud (David’s Prayer Niche). The name Tower of David then survived in Crusader and Ayyubid times but only in relation to the north-eastern tower of the newly founded Citadel. 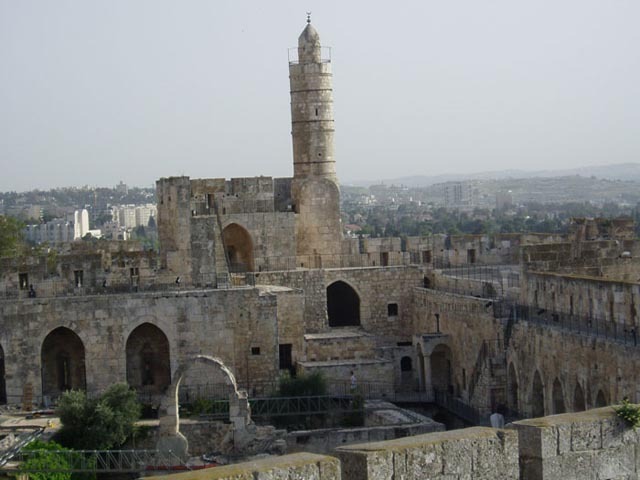 However, in the nineteenth century Jewish and European travellers mistakenly gave the name Tower of David to the seventeenth century minaret of the mosque in the South-west tower of the Citadel. From that time on it has ironically become a Jewish symbol of Jerusalem, appearing on various objects such as plates and prayers books. Following Israel’s occupation of Jerusalem in 1967, the Citadel was officially renamed as the Tower of David, and the new museum was established within it. The Citadel of Jerusalem is a major archaeological site in East Jerusalem, which has been occupied and subsequently illegally annexed to Israel in 1967. 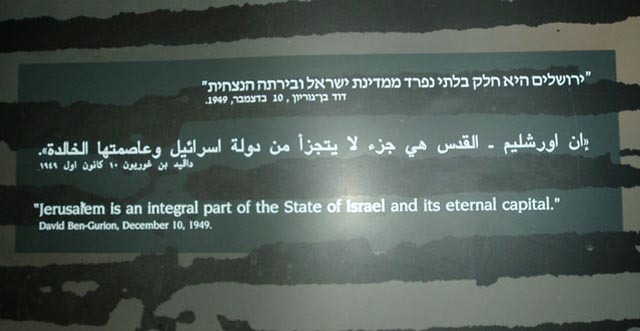 The Citadel has been appropriated by the Israeli authorities to serve ideological and political purposes. 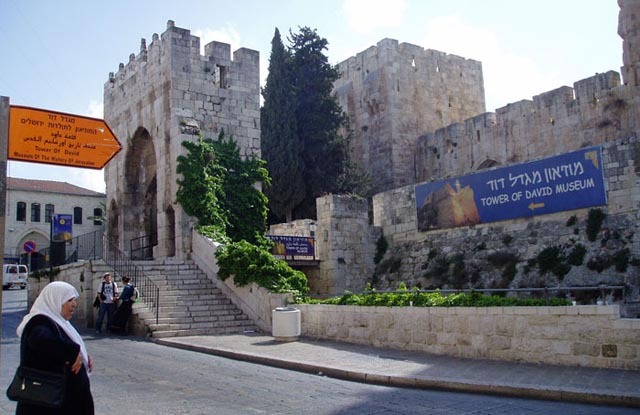 The Tower of David Museum of the History of Jerusalem tells a biased story of the city from ancient to modern times through a series of modern displays. Using the Citadel as an architectural/archaeological setting, it attempts to bridge three millennia of history and thus promote continuity between Jewish past and present, with complete disregard and contempt for the indigenous Palestinian Arab inhabitants of the city. The lack of presentation and interpretation of the architecral history of the Citadel and the re-naming the site serve this purpose. The appropriation of the Citadel and the museum’s design should be understood in the context of Israeli projects and activities in and around the city of Jerusalem since 1967, particularly around the Haram al-Sharif and the suburb of Silwan. These have been carried out with the aims of reinforcing Israel’s historical claims to the city and promoting its 'unique Jewish character.' Israel’s annexation of Jerusalem under the pretext of resurrecting the capital of a Jewish United Kingdom that supposedly existed some 3,000 years ago is an anachronism and affront to history, and is contrary to international law and UN resolutions. Above all, it violates Jerusalem’s status as a Holy City, with a diverse cultural and historic heritage common to more than half of humanity. Abu El-Haj, N 2001 Facts on the Ground, Archaeological Practice and Territorial Self-Fashioning in Israeli Society. Chicago and London: University of Chicago Press. Johns, C N 1950 “The Citadel, Jerusalem: A Summary of Work Since 1934.” Quarterly of the Department of Antiquities of Palestine, XIV: 121-190. Piacenza, A 1896 “Of the Holy Places...” Palestine Pilgrims Texts Society, II (translated by A. Stewart).